Creation: Appeared Oct 1935 (CTB) as a newly numbered route. Ran as it does today. This is the 2nd VA 300. Posting: Fully posted at US 60 and VA 300Y but not at all at VA 13. Legislative names: Marion Harland Lane (entire route), designated 2-22-50. 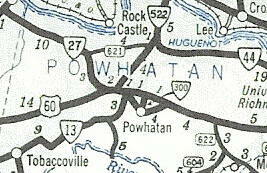 Comment: A short connector that really doesn't serve that much purpose, as US 60 and VA 13 meet on both sides of Powhatan providing simple access. 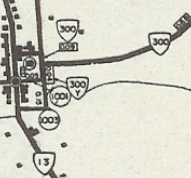 VA 300 #1: Appeared in 1929 as a newly numbered route. 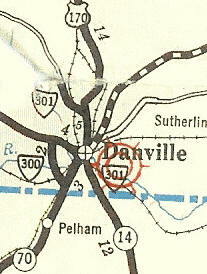 Ran from US 170 (curr VA 293) to VA 12 (curr VA 51) west of Danville. VA 300 was renumbered as VA 125 in July 1933. Today it is unnumbered. Creation: Appeared Oct 1935 (CTB) as a newly numbered route. Ran as it does today. This is the only Y route to be posted correctly in a white rectangle.